I received an ice cream machine for my birthday from X and I promised him that mango sorbet will be the first thing that I’ll make with the machine, because that is his favourite ice cream on Earth. And I finally did it… after one year later. Yup, you heard me right, one year later. 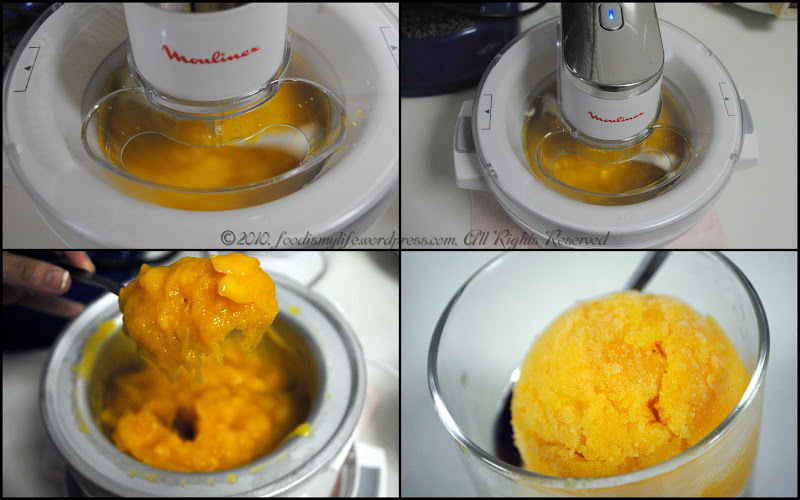 X and I used Thai honey mangoes for this sorbet. A friend of ours said that Thai honey mangoes (small ones) are most of the time guaranteed sweet so they will be perfect for making sorbet. In order to get 1kg of deseeded mangoes, we bought around 1.5kg of mangoes, which gave us just nice a little over a kg of diced mangoes. I boiled some sugar syrup and let it cool before adding it into the mangoes. I am thinking of omitting the sugar syrup in the future and just let the mangoes’ natural sweetness do their job, but I guess that depends on the mangoes’ sweetness. A little lemon juice was also added and that offset the sweetness (from the mangoes and sugar syrup) and brings the flavour to a higher level. A couple of tablespoons of rum was added as well and before the churning of the mixture, the taste of rum was still pretty strong, however, after churning, we can’t taste the rum anymore. So I guess I’ll add more rum in the future! We made this sorbet last Saturday, and now it’s already all gone (in like less than a week)! So I guess I need to go buy more mangoes now! As I didn’t have a blender (my blender is unfortunately spoiled), instead of puree all the ingredients, I mashed the mangoes up. Not all the mangoes are fully mashed but that didn’t really make a lot of difference in the final product. In addition, I dissolved the sugar in the water before adding it into the mangoes so that I won’t taste any sugar grains. I believe the rum is additional, however try not to omit the lime or lemon! I think that it gives an additional edge to the flavour. In order to get 1kg of diced mango, you’ll roughly need to buy around 1.5kg to 2kg of mangoes. And when I peel/dice the mangoes, I always peel/dice them above a bowl to catch all the mango juices. You wouldn’t want to waste them! Combine the ingredients and puree until smooth, adjusting the flavour (adding more lime/lemon juice or rum as you go along). Chill the mixture thoroughly and churn in your ice cream machine. Place sugar in a pot. Pour water over the sugar to wet it but do not stir to dissolve the sugar. Put it over high heat and bring it to boil. Boil for 2 minutes and remove from heat. Leave to cool completely before using. Combine all the ingredients and mash until smooth. There may be chunks of mangoes in the mixture but it’s alright, we can live with it. (: Chill the mixture thoroughly and churn in your ice cream machine. It is thoroughly loved by parents, brothers, sisters, friends, spouses, girlfriends, boyfriends, and definitely kids! Can we make it soon?